The vibrant Brake Screechers™ Sign kits are hard to miss. You’ll have potential buyers practically slamming on their brakes to come to your Open House event when you sell your home fast. Dynamic and eye catching, these signs are an amazingly effective way to advertise your sale—they will literally stop traffic! The design of the Brake Screechers™ Sign kits have been developed and perfected over time for maximum marketing impact. 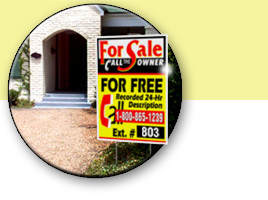 These signs kits will deliver 30 to 50 % more interested buyers (who may have not seen your classified ad) to your property regardless of price-range, weather, or location and greatly assist your sale to sell your home fast. You could spend between $1,000 and $1,500 at your local print shop to duplicate these signs — we know, we’ve priced them out — and STILL not have the top-notch design, quality, and sell-your-home-fast results of these signs. That’s a savings of over 50%! These sign kits are one of the best ways to create a powerful marketing presence for your sale. They’re easy to implement, extremely effective, and incredibly durable. Use them again and again — perfect for investors. Starting at $595.00 — includes FREE UPS Ground shipping! *Recommended for homes with a value of $60,000-$225,000. Upgrade Available! Need a 1-800 number for your sale? Click to learn more on how to upgrade your sign Package A to include a 1-800 number, available 24 hours a day, for just $49! *Recommended for investors, homes $225,000 and above, homes in rural areas, or homes needing additional directional signs for turns and side streets. Upgrade Available! Need a 1-800 number for your sale? Click to learn more on how to upgrade your sign Package B to include a 1-800 number, available 24 hours a day, for just $49! *Signs ship from Louisiana. Please allow 2-3 business days to process order and 1-6 business days for delivery. 1 or 2-day delivery available if needed. **Price includes FREE UPS Ground shipping. Express shipping available. Special Bonus! Upgrade to our 5 Day Sale Premium Sign Package for $49!